This is the kind of dish that tastes incredible, yet takes so little time and energy to prepare. That never happens, right? With the kick from the spices, the tang from the lime and the heartiness from the squash and beans, this might just be the perfect winter lunch or dinner. Oh, did I forget to mention it was in a wrap? Give me anything in taco form, and I am so happy - always. Leftover tortilla shells? Fear not, here's a little taco inspiration: miso maple sweet potato, brussels sprouts + kimchi & kale + brussels sprouts. Carefully cut the squash lengthwise in half. Place it face down on an aluminum-foil lined baking sheet. Roast for 45-60 minutes. When you remove the squash from the oven, carefully, wearing an oven mitt, flip the halves over and release the steam. Allow to cool for a few minutes. Once cool enough to handle, use a fork to remove the 'spaghetti' from the shell and transfer into a large bowl. Add the lime juice and spices and stir to combine. Taste and adjust seasoning if necessary. Heat a skillet over medium-high heat. Warm and slightly toast each tortilla shell. 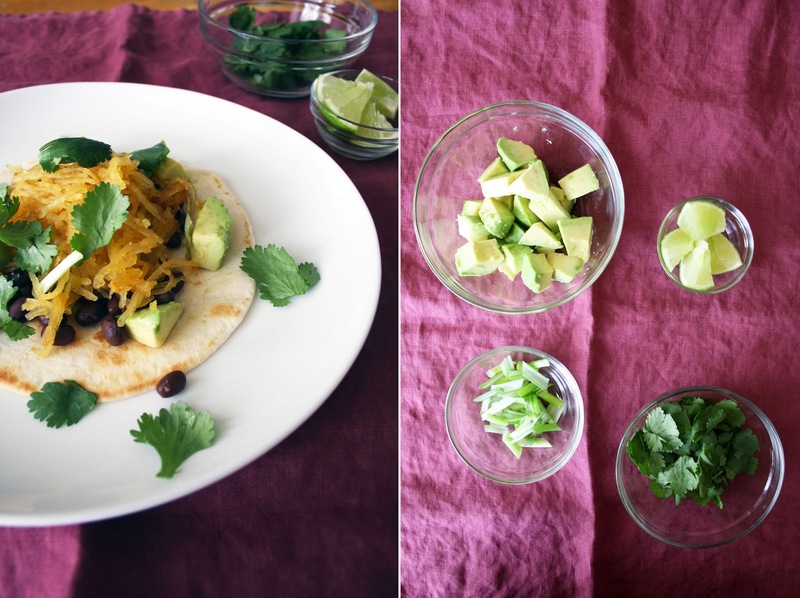 To assemble, place a scoop of beans and a heaping scoop of squash on the tortilla. Finish with sliced green onions, fresh cilantro, some avocado and a squeeze of lime juice. Hot sauce if desired. Like I said, easy peazy.